An arrangement of Karlheinz Stockhausen's composition Tierkreis, in which 12 melodies are based on each of the zodiac signs. Each of these had been composed using a combination of serial and twelve tone composition techniques, as well as being based traits on friends and family of Stockhausen under their respective zodiac signs. I've based my arrangement of Tierkreis; for two synthesizers and trumpet, using Stockhausen's supplementary text. 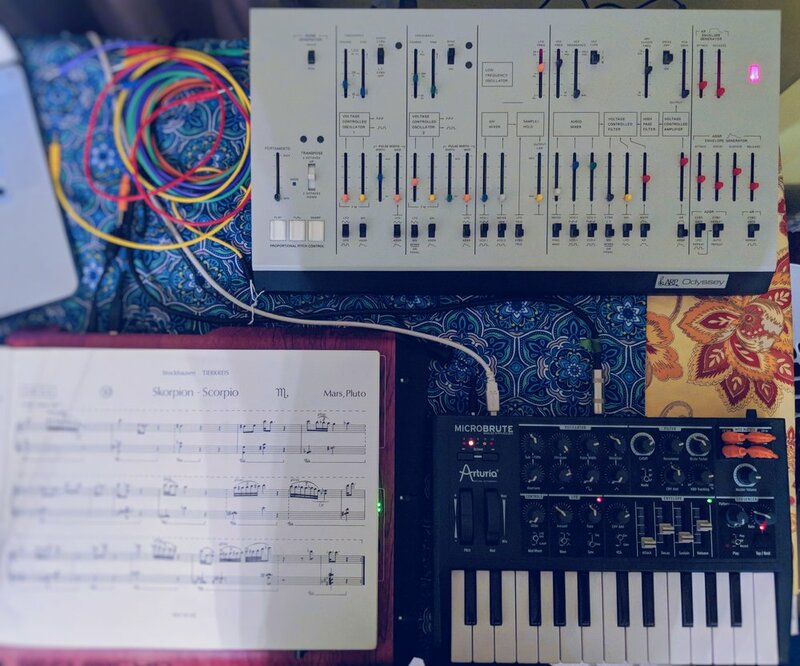 This arrangement is also modular, in that it can be for two synthesizers along with trumpet or other instrument/voice, allowing for live performance and the ability to create new patches for each of the signs. The process of creating this arrangement is documented on this page. 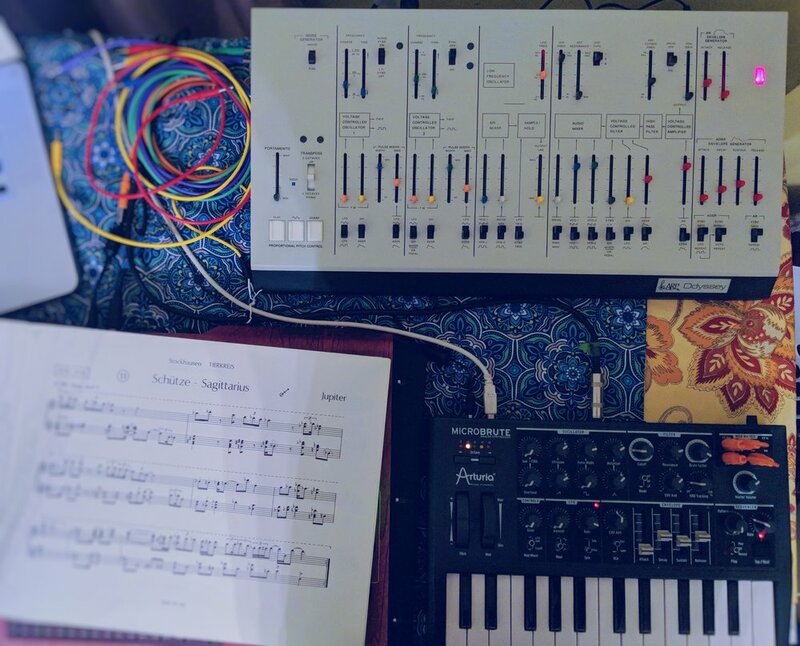 The synthesizers I used are an Arturia Microbrute and Korg Arp Odyssey module, which are being sync'd through Ableton Live. Prior to working in Ableton, I input each of the 12 zodiac melodies with harmonies into Sibelius notation software, exporting the midi data and then importing it into in Ableton. Each of the 12 melodies and harmonies was then placed into a midi track; in Ableton's Session View, for each of the respective synths . I then had each of Ableton's clip scenes launch set to the correct time signature and tempo for correct playback and color coded each of the clips with their corresponding zodiac sign. The Microbrute; is a monophonic synthesizer, plays all of the main melodies, except for Cancer which it plays the harmony line. 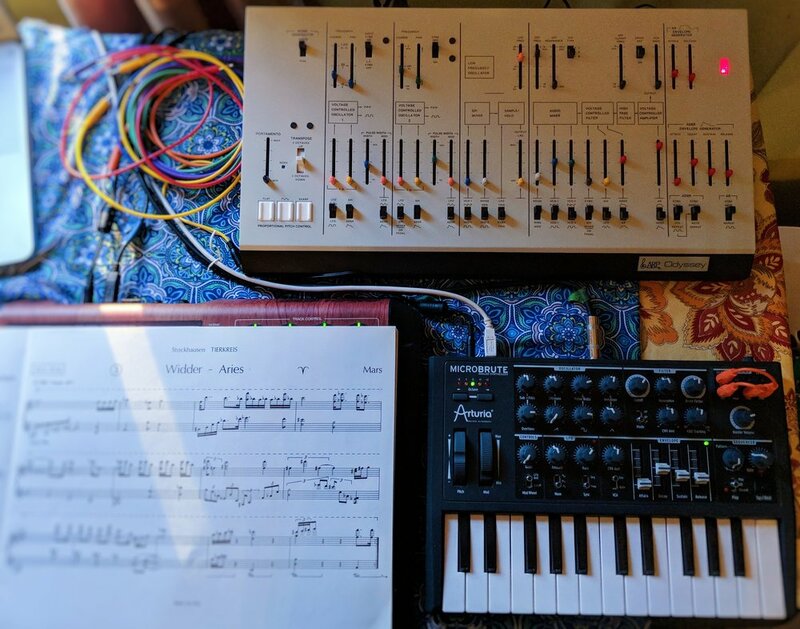 Korg's Arp Odyssey maintains the the original circuitry of the original with the addition of USB and midi, and is able to be duophonic. The duophonic structure allows for each of the voltage controlled oscillators (VCO's) to play in unison when a single note is played. When two notes are played, low note priority is for the first VCO and high note priority for the second VCO. I used this duophonic structure in the Arp Odyssey to play the harmonic lines for each of the melodies, excluding Cancer which takes the main melody. A formal structure of the arrangement was created based on Stockhausen's supplemental text (formal structure of the arrangement can be downloaded here). I then designed a preset for each of the 12 zodiac signs for the Microbrute and Arp Odyssey (each of these presets are shown in the images below). I hope you enjoy Tierkreis for Trumpet and analog synthesizers. In June of 2018 David performed his arrangement at Chosen Vale Trumpet Seminar in a masterclass for Marco Blaauw. With the input of Marco, David continues to develop this arrangement of Tierkreis.